Hello! I’m back from my self-granted maternity leave and I’ve missed you! Hopefully we’ve been keeping in touch on Facebook, Twitter, and Instagram. As I ease my way back into food life again, I thought that this Chinese Pork Bone Stock would be the most suitable post. After all, I have drank a lot of this in the last few months because the Chinese believe that it helps build your breast milk supply. Chinese Pork Stock is so easy that I debated if it warranted it’s own blog post for a long time. It’s such a no-brainer and the exact measurements are not even that important. I’ve given some here for those that like to measure and feel secure yet you should know that I eyeball this one every time I make it, which is all the time. It’s more of a pantry item that I always need to have around. As easy as it is to forget about this as a “recipe”, it’s a crucial and important one to know because it’s the base to many many other soups and dishes. While this is technically a stock, the Chinese translation is just “bone soup” and it can be drank as is (with a little salt and pepper). I had mugfuls for the first few weeks after Remi was born. 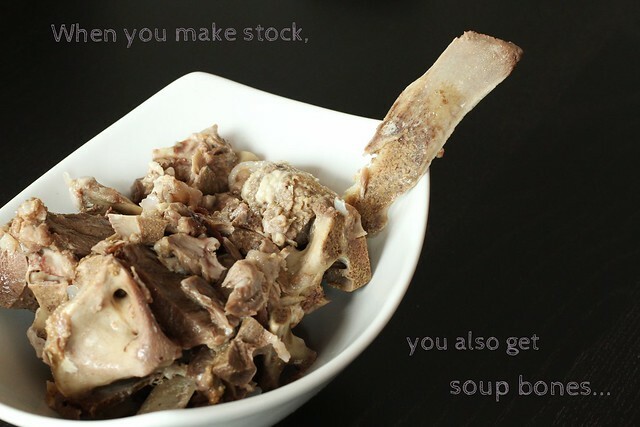 And, when you make stock, you get soup bones…I love picking through for bits of meat and dipping it in a mix of soy sauce, vinegar, and sesame oil. Yum! My mom taught me to make the Chinese Pork Stock in a pot which is how she still makes it. I made it that way for years but switched over to doing it in a slow cooker about a year ago and find it much more convenient, especially with a newborn around! I’ve given both methods below. *If you are in the tri-state area, consider getting pork bones from Spring Lake Farm. I find that theirs makes the most flavorful stocks! 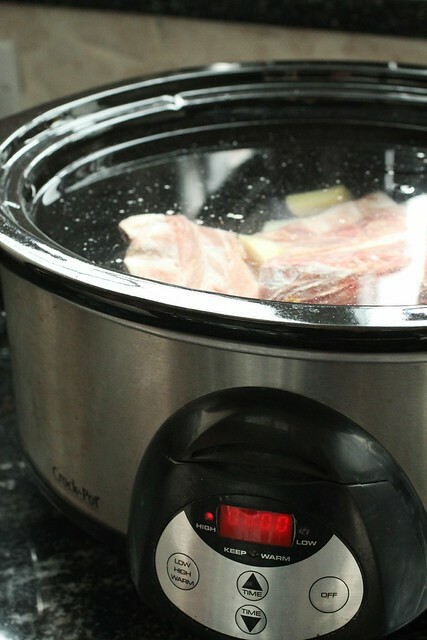 Place pork bones into the slow cooker. Add water and ginger. Cover and set on high for 8 hours. Strain and use or cool completely before refrigerating or freezing. 1. Place pork bones in a large pot. Add water and ginger. 2. Bring to a boil. Reduce to a simmer. Skim the skum and foam on top and discard. 3. Continue to simmer uncovered for 6 hours, checking to refill water so that bones remain covered by water. Strain and use or cool completely before refrigerating or freezing. 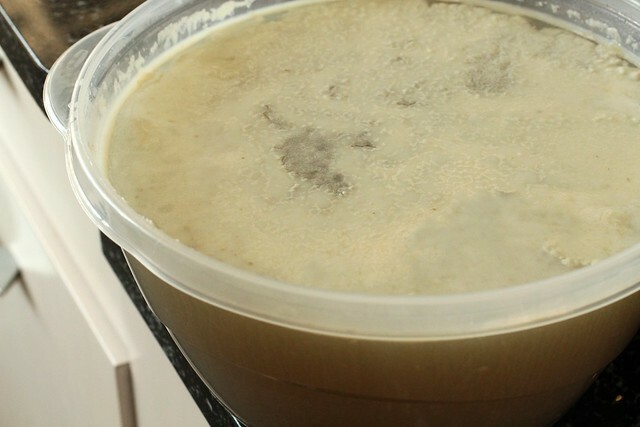 *Tip: If you want to remove the fat, place the stock in the refrigerator for several hours. The fat will float to the top and harden and you can scoop it off. posted by jessica	at 11:04 AM	Filed under Basics, Chinese. You can follow any responses to this entry through the RSS 2.0 feed. Both comments and pings are currently closed. Ha! I love this! After I gave birth, all my mother would feed me was soup – this and THE most intense chicken broth/soup I’ve ever had. I love your blog and am glad you’re back. I’ve been following your Chinese and Chinese-fusion recipes since my little one was born. I appreciate and enjoy simple home cook recipe like this. My most favorite recipe (hands down) online is your tee pong pork shoulder. It was a taste i remember from my childhood but since we were not taught how to cook and all the family cooks (grandmas) are no longer with us, your recipe was such a treasure because it tasted just like my childhood favorite pork. Shannon, thanks for reading and it’s good to know about the vinegar. My husband doesn’t eat any dairy either! So glad you’re back. Glad you posted this. I’ve always wonder if I need to boil the bone first to get rid of gunk if using slow cooker. Now i know I don’t have to. Thanks for sharing. Dido on Lulu’s comment. Love your blog. Your Pin buttons are not working. The method that many Asians employ to get keep their meat stocks clear is to bring the bones and/or meat to a boil, and then rinse until all of the loose particles have been removed, and wash your pot or use another clean one when you cover with water to continue cooking. I have always prescribed to skimming as the stock comes to first boil, and straining as a last resort. If you fail to skim the scum at first, all the particles fall back in the water and you will never be able to get it really clear. Now I find the Asian method to be the most effective way to get a clear stock. I would employ this method before I transfered the bones to the slow cooker in this recipe. are international tournaments like world cup and the Asian Cup that draw crowds.